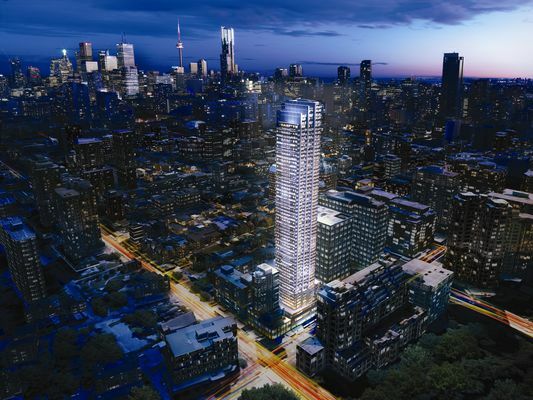 The Rosedale on Bloor is a great new project located at Bloor & Sherbourne, well situated at 387 Bloor St E. The Easton's Group is developing a 52 storey tower with 476 units, in the core of downtown Toronto. The Rosedale on Bloor is an equal distance to the University of Toronto and Ryerson University. Conveniently located, residents will be only minutes to the world class shopping, restaurants and galleries in Yorkville. The Rosedale on Bloor is steps to the TTC subway station, Yonge Street Corridor, and will have breathtaking views of Rosedale Valley and downtown Toronto. The Rosedale on Bloor has a 94 Walk Score, and a 93 Transit Score. It will also have hotel class amenities with a 24 hr concierge, exquisite lobby, lounge area, pool and outdoor terrace. Page + Steele / IBI Group Architects is an award winning architectural firm with an extensive portfolio such as Hazelton Hotel & Residences in Yorkville, The Met Condos and Ritz Carlton Hotel & Residences. Page + Steele / IBI Group Architects’ work is unique, timeless and artistic. The modern and contemporary building exterior and interior design is stunning. It fits in perfectly within the upscale neighborhood. Overlooking one of the priciest and wealthiest neighborhoods, the Rosedale on Bloor Condos is the definition of luxury lifestyle. TREB recorded over 7,500 condo transactions in the 2nd quarter of 2015, resulting in 17% growth. in 2036, population of Toronto will be 9.5 million. In 10 years, real estate prices will be the same as New York City. The Easton’s Group’s portfolio includes a wide range of premium hotels, event spaces and condos for over 40 years. VIP sales are currently underway for my clients, and are being sold on a first-come, first-serve basis. Contact me as soon as possible for further details.